We are an integrated marketing and digital technology solutions company driving interaction of your business through engaging and smart solutions. We are experts in geo-spatial and map-driven community solutions delivered through our Forward Movement Platform, enabling smarter and more engaging interactions. Our recent work with #GoParksLondon has been highlighted as one of the Best UK Charity Digital Campaigns of the Year 2018, and used the Forward Movement Platform to create the interactivity to maximise and deliver this campaign. Forward Movement Platform (FMP), our proprietary solution, was inspired through the Mayor of London's (GLA) 'Active Travel' and 'Healthy Streets for London' initiatives. At its core, FMP encourages walking and discovery with a view to changing attitudes and behaviour to travel. Recognising the important issues of having a healthier lifestyle and helping to make our environment greener, FMP aims to help people notice, explore and engage in their surroundings by using the best street routes possible. FMP is a consumer-facing mobile application, backed by a web interface, intent on engaging target consumers with specific places and locations through face-to-face interaction using pre-defined interests to create a route. This application can be applied to any type of physical attributes to help engagement, from trees and parks, to restaurants and cafes/bars, through to historical monuments and event listings. 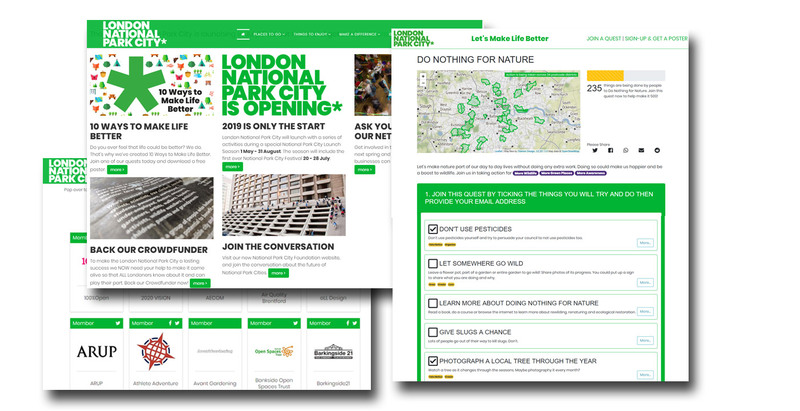 London National Park City, expandable and flexible magazine and campaigning website and supporting CMS. We designed and built the website which engages Londoners with challenging ideas and guides in support of the campaign to make London greener, healthier and wilder. We have also built several complementary FMP-powered interactive campaign tools which sit alongside, including Make Life Better a crowd-sourced campaign sharing and promoting challenges and actions for any Londoner to take on, WildHomes integrating a map with a quirky social media campaign, and StationWalks which allows users to create their own walks between London's stations. GoParksLondon, a campaign developed for CPRE London, to support Love Parks Week and the first National Park City Week (July 2018). 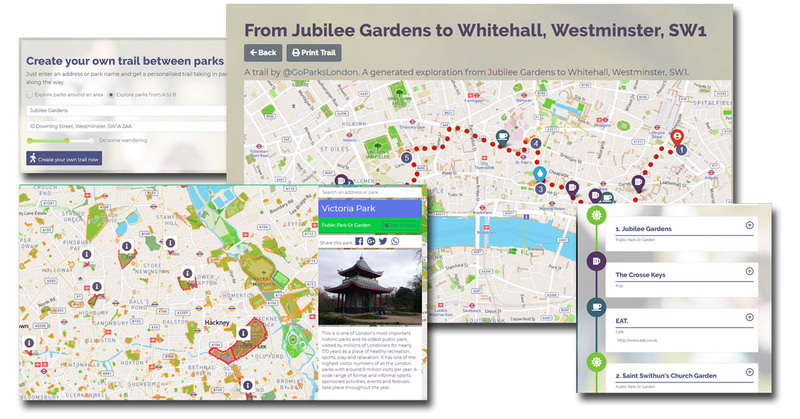 A bespoke website designed and created incorporating the FMP platform to help individuals discover new parks in London and create walking routes to, from and between them; together with an event listing of over 100+ events to encourage the activity. This campaign was supported by social media (Twitter, Instagram and Facebook) which we planned, created and delivered. 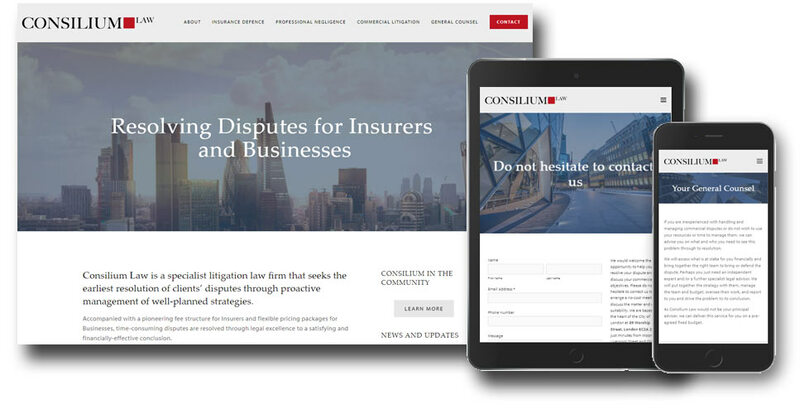 Consilium Law, launched in 2019, delivers a contemporary and design-led website to differentiate and stand-out from competitor law firms. Working from initial brief to final solutions, we created the company logo, advised on user experience (UX) and imagery, to deliver a content-led website. We also set-up domain names and provided CMS access for regular news updates allowing for continual future engagement and site relevance. TreeTalk, a joint project with Paul Wood, aka The Street Tree leads you through London’s Urban Forest by mapping more than 100,000+ trees, and providing an itinerary solution to create your own personalised trail and discover London's street trees on foot. The bespoke application uses the FMP platform’s routing engine to deliver the interactive tree information. It is available as responsive website and a simple app for use on the move. We are approachable digital experts providing you with the best results. Rob has spent more than 20 years working for digital and integrated marketing agencies, delivering campaigns from local to international level. Rob brings a wealth of digital expertise including developing brand and promotional websites, microsites, social media campaigns, eCRM strategy, and mobile app builds. Previous clients include Novartis, The Law Society, Kraft, Diageo, Hewlett-Packard and Coca-Cola GB. Quite simply, he’s passionate about delivering the best results and in his spare time can be found cycling in and around London. Steve has over 25 years experience in software development and product management in both startup and established companies. This includes over 10 years’ experience as a senior technical manager and director, building and operating large scale, global, consumer-facing products, including mobile, web and gaming devices. Having worked in music technology for many years, he has wide experience of handling Big Data, and creating added value from complex, disparate, data sources. Steve is a keen tree fan and photographer, and loves exploring and finding nature in London, and is a voluntary campaigner for the London National Park City.